That’s right folks, the time has come for the excitement to commence! Let’s wind the pre-release excitement to maximum! TheBigKnights.net is giving you an exclusive chance to win a SIGNED copy of The Big Knights DVD & Blu-Ray. Click the banner below to enter now. We’re really proud to be partnering with Astley Baker Davies and e1 entertainment to bring this exclusive opportunity to you. ABD wish you all good luck. There are a couple of other Big Knights DVD competitions floating about on the net at the moment but non are offering you a prize as special as this. We have signed copies of the DVD & Blu-Ray to give away courtesy of AstleyBakerDavies and e1 entertainment. I make it 19 days until The Big Knights DVD and Blu-Ray is released, exciting! The final DVDs are expected with the supplier early next week. Keep an eye on the site, as promised, we’ll be doing something pretty exciting before release day. If you haven’t pre-ordered yet, what are you waiting for??? CLICK HERE to pre-order your copies now (one for you, one for your kids, one for your dad & mum, one for your gran and don’t forget the post-man who will be bringing them, order one for him too!). Don’t forget there’s no reason to wait to order as if you order through Amazon, they will charge you the price it is on release day in case it goes down in price. 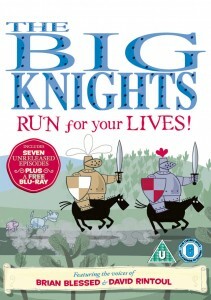 Amazon has dropped the pre-order price for The Big Knights DVD & Blu-Ray a whole £1.50 to £7.49. Those of you who have already pre-ordered worry not, Amazon will charge you the price at release in October. For those of you who haven’t pre-ordered yet, what are you waiting for? A DVD & Blu-Ray copy of all The Big Knights episodes in one box for £7.49, what more could you ask for? Here is the official press release from those wonderful folk at e1 entertainment who are partly responsible for this release actually happening. You even get a mention! From the creators of the hugely popular Peppa Pig and Ben & Holly’s Little Kingdom comes The Big Knights, the hysterical animation series, available for the first time on DVD. Join Sir Boris (the finest swordsman in the World) and Sir Morris (not the finest swordsman in the World, but the most enthusiastic) and their trusty, armour-clad pets Horace the dog and Doris the hamster as they bash, belch and bellow their way through 13 rib-tickling episodes! The Big Knights first crashed onto our screens in 1999 on BBC TV, picking up multiple animation awards along the way. When the series finished it left a legacy of Big Knights fans who have tirelessly petitioned for the series to be released on DVD. On 25th October their wish will finally be granted, courtesy of Entertainment One. This DVD – which includes a free re-mastered HD special edition on Blu-ray – features all 13 episodes of The Big Knights, seven of which have never previously been available to own. As well as Brian Blessed and David Rintoul providing the voices of Sir Morris and Sir Boris respectively, listen out for some famous guest stars including Timothy West (King Otto), Prunella Scales (Queen Melissa) and the inimitable Brian Sewell (Sir Kiftsgate). What the Big Knights lack in bravery and chivalry they make up for with boundless enthusiasm. Among their many adventures, Sir Morris and Sir Boris rescue two mischievous princesses from a tower, take a holiday in the Land of Vampires and go under cover in their wondrous ‘hats of invisbility’. Hilariously funny and very silly in equal parts, the Big Knights will have family members from 6 – 60 in stitches. It’s an essential addition to your castle’s DVD collection! Running time: 56 Minutes Approx. Click here to pre-order The Big Knights DVD & Blu-ray now! Just in case there is any confusion, if you’re after The Big Knights Blu-Ray disc, it is FREE with the DVD. Some people have been asking where the Blu-Ray is on the amazon link, the answer is, it comes free with the DVD! Order the DVD copy and you get all the episodes on Blu-Ray on a free disc with it. Happy days! Click here to order The Big Knights DVD & FREE Blu-Ray now! Good news, the forum is now back in action, it was taken down due to spam bot abuse but after implementing some new anti-spam measures it’s ready for use again. Hopefully more of you may decide to drop by and give your “two cents” on anything that takes your fancy! Things seem more quiet than we expected after such a big announcement, I mean, some of us have been waiting 10 years for this good news! Just in case you missed the news last week, i’ve put it in capitals in the title again! The Big Knights DVD and Blu-Ray is NOW AVAILABLE to pre-order! [UPDATE:] Some people have been asking where the Blu-Ray is on the amazon link, the answer is, it comes free with the DVD! Order the DVD copy and you get all the episodes on Blu-Ray on a free disc with it. Happy days! Thanks to those of you trying to spread the word, if anyone can spare 5 minutes to share the good news with their friends, any forums they are part of, their facebook profile, twitter, whatever! Please post this link http://www.thebigknights.net/dvd or tell them about this site and share the good news!